Adelia Barber hiked the Continental Divide, worked on a conservation project in Tanzania, and studied environmental science as an undergraduate at Brown University in Rhode Island. But her old stomping grounds, the Santa Cruz Mountains, kept calling her back. "I have a strong sense of place and I really identify with the area here," said the 28-year-old graduate of Los Gatos High School. Now a graduate student in ecology and evolutionary biology at UC Santa Cruz, Barber said she was happy to come back. "I'm a total plant junkie and I love California's plant life--the redwoods, the chaparral, the desert wildflowers," she said. Because she's also a self-described math geek, Barber decided to explore a relatively new area of plant ecology that uses computer models to understand plant populations. At UCSC, she found a terrific advisor: Daniel Doak, professor of ecology and evolutionary biology. And she found the perfect species to study: bristlecone pines, the oldest living things on the planet. "As a fluke, before grad school, I took a road trip to the White Mountains to see the bristlecone pines," explains Barber. "I just fell in love with them." Bristlecone pines live as long as 4,000 years, and because of their dense and resinous wood they remain standing thousands of years after they die. These trees offer ecologists a rare window on populations from many climatic periods of the past. Barber joined Doak's lab in 2004 and began trekking to the UC White Mountain Research Station to collect field data. 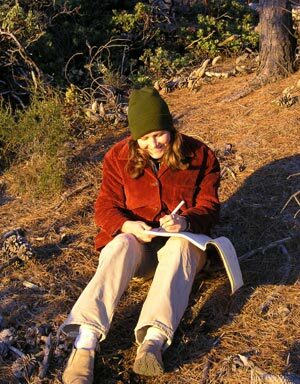 Back in Santa Cruz, she started developing mathematical models to study how bristlecone pine populations have adapted to environmental change in the past. Ultimately, the research could lead to predictions about how global warming might affect the trees in the future. According to Doak, studies of this kind require an expanded sense of time. "What's unique about Adelia's mind is that she's able to think on very long time scales--a skill that very few of us have," he said. Yet Barber hasn't let her focus on ancient trees and vast stretches of time slow her down, Doak adds. She still responds quickly to immediate issues. And that's why a funny thing happened on the way to Barber's Ph.D. dissertation. Back home in her beloved Santa Cruz Mountains, Barber met some residents who were angry about a proposal to log on acreage owned by the San Jose Water Company. She was familiar with the territory--watershed land that provided one-quarter of the drinking water for Silicon Valley. The 7,000-acre property had been off-limits to the public for 100 years and boasted many plants and animals not common elsewhere. It also remained relatively free of invasive species and of the disease called sudden oak death, making it "quite pristine for this area," she said. Barber agreed with the local community that this particular land should be reserved for open space and watershed recharge. What really bothered her, though, was that the company had applied for a permit that would allow Big Creek Lumber to harvest trees every 10 years "in perpetuity," without regular review. Under state law, that kind of permit was reserved for landowners with less than 2,500 acres of timberland--defined roughly in legal terms as land that contains redwood and Douglas fir trees. The company claimed to have only 2,002 acres of timberland. But that number was not backed up with any data or explanation of how it was calculated. "That was totally inadequate," recalls Barber. "It was a scientific question and they should have said which criteria they used, because there are many ways you could map it." Although it took time away from her dissertation, Barber jumped at the chance to volunteer to be a scientific consultant for the grassroots group Neighbors Against Irresponsible Logging (NAIL). The group decided to find out just how much timberland really was on the San Jose Water Company's property. She joined forces with volunteers Rebecca Moore, an engineer who worked at Google, and Jody Frediani, a forestry expert. The NAIL volunteers were able to get high-resolution aerial photographs, taken from a helicopter, of each acre of the property. Using Google Earth software, Barber scrutinized the photos, identified the redwoods and Douglas firs, and tallied the acreage. She found 2,733 acres of timberland--233 acres more than the law allowed for that kind of logging permit. That was a conservative estimate, she said. "To eliminate questions regarding interpretation, I chose to use the simplest, most conservative and non-controversial criteria for this determination of 'timberland,'" she wrote in a letter to the California Department of Forestry (CDF). Barber described her methodology to the state agency in a 133-page report, which she compiled and then posted on a public web site. "Our biggest concern at NAIL was that they'd think we were a rag-tag bunch of Santa Cruz environmentalists and then they'd try to discredit our evidence," Barber says. "So I put up the data for everyone to see." The war of numbers heated up. Big Creek Lumber remapped the area and reported that the property contained just less than 2,500 acres of timberland. But the company still didn't fully explain its methodology, according to Barber. Then the CDF flew over the property and made its own determination: the timberland totaled at least 2,800 acres. Barber's analysis was vindicated. In October, the CDF announced that it was denying the logging permit. "We were so happy, and really impressed that CDF came up with a truthful estimate," Barber recalled. But the battle isn't over just yet. The San Jose Water Company has requested an appeal before the State Board of Forestry. Barber and her colleagues at NAIL will present her data at the hearing, which is to be held in Sacramento this winter. Barber is still a couple years away from completing her dissertation, but the delay was well worth it, she said. Working on the logging battle taught her an invaluable lesson. "I've been involved in conservation before, but I never saw anything like this happen, where it was done so effectively," she said. "We weren't doing tree-sits and holding protests. We were sitting at our computers and slaving away--and it worked."